Carbon pricing is a good idea whose time has not yet come. But it has to do so. The world committed itself to keeping average temperatures at less than 2°C above pre-industrial levels and ideally to less than 1.5°C at the Paris climate conference in December 2015. If it is to achieve this goal, it will find the price mechanism the most powerful weapon in its arsenal. Prices affect people’s behaviour powerfully and systematically. A price — via a cap and trade system or via simple taxation — on the carbon content of fossil fuels would influence the choices made by all producers and consumers of goods or services that demand commercial energy in their production and consumption. That is just about everything in a modern economy. Moreover, carbon prices can achieve this outcome, without reliance on top-down command and control. They would also raise revenue, which governments can use to offset the burden of carbon pricing on vulnerable or badly affected groups, and promote investments in climate change mitigation and adaptation. This combination of simplicity, comprehensiveness and effectiveness makes carbon pricing an ideal way to help bring about needed long-term changes in behaviour, across the planet. Yet, for all these virtues, progress has been limited. On the positive side, according to the World Bank, 42 national and 25 sub-national jurisdictions now put a price on carbon emissions. However, 85 per cent of global emissions are still not covered by carbon pricing. Moreover, even where it is in effect, price levels are mostly significantly below the $40-$80 per tonne of CO2 by 2020 and $50-$100 per tonne of CO2 by 2030 recommended in the 2017 Report of the High-Level Commission on Carbon Prices, chaired by Nicholas Stern of the London School of Economics and Columbia University’s Joseph Stiglitz. In all, in scope and scale, the carbon pricing now in use falls far short of what is needed to reach the globally agreed targets. So why has the adoption of carbon pricing been far less widespread and effective than it needs to be? One explanation is that some jurisdictions — notably, the US of Donald Trump, at least at the federal level — reject the argument for tackling climate change. So Mr Trump has now repudiated commitments made by his predecessor’s administration, on the grounds that this would damage US growth. Inevitably, this decision by the world’s second-largest emitter (after China) undermines the willingness of others to act effectively, partly because such freeriding on their efforts is unfair and partly because it increases the costs they have to bear, to achieve a given global outcome. Another reason for the limited adoption of carbon pricing is that even countries which have made commitments to lower national emissions may not mean what they said. A rhetorical commitment is one thing; unpopular action is quite another. Such reluctance is inevitable. It is always hard to persuade people to pay a price for something they have historically received for free. The atmospheric carbon sink is a perfect example. The complaints of the losers will also be loud. Some of those adversely affected by high prices on carbon emissions are relatively poor people who live in rich countries that depend on energy-intensive lifestyles, for example low-income Americans who need to drive. Still more politically potent are energy-intensive industries. The latter complain about the impact of higher energy costs on their competitiveness and threaten to move production to countries with lower costs. That makes the goal of reducing emissions even harder to reach. This underlines a fundamental difficulty. The simplest of all policies would be to have a single global price. However, this requires agreement on that price (or tax or cap-and-trade system), which is impossible in practice and also raises questions of equity, in the absence of an efficient system to compensate losers who are poor. In practice, prices are set nationally. Moreover, the obligations on rich countries, with higher historic emissions, higher emissions per head today and a larger capacity to protect their citizens from ensuing costs, are rightly greater than those on poorer ones. With differential obligations go differential policies. This adds to the likelihood that carbon pricing will be evaded. Could pricing be made more effective? Any policy change must come quickly, or it will be impossible to remain under the recommended temperature ceilings. To speed adoption, governments need to promise to use some of the revenue they raise from carbon pricing to lower other taxes and, above all, compensate some of the hardest hit. Also, carbon prices would not need to be quite so high if governments introduced complementary policies. Among the most important policies of this kind will be the elimination of subsidies to fossil fuels — effectively negative carbon taxes and estimated by the International Energy Agency at $493bn in 2014. Other complementary policies will be changes in the planning of urban development and of new energy-related infrastructure, along with higher regulatory standards on fuel efficiency. Within the general approach of letting each country meet its own objectives in its own way, via “nationally determined contributions” (the only workable approach), countries can make up their own minds about whether to opt for a carbon price, a carbon tax or a cap and trade system. They may also create hybrid versions. Nonetheless, the notion of agreeing a global price system has obvious merits. A promising compromise, under discussion, is to link up the various national (and European) pricing schemes, on a voluntary basis. A big practical and political difficulty is what to do about those who refuse to participate in the endeavour. To make the proposed carbon pricing schemes work politically, sanctions for the recalcitrant — countervailing tariffs, perhaps — will need to be considered. Otherwise, freeriding will make hitting the goal far harder. Until now, therefore, carbon pricing remains a sleeping giant. Yet needed progress will not be achieved if it does not awake. The difficulties in meeting agreed objectives in our fractured world are enormous. The chances are high that the effort will fail. If so, our goose will be cooked. LONDON – There was a time when many regarded being in the middle of the distribution – socially, politically, and in the business world – as a favorable, stabilizing, and desirable outcome. From the anchoring role in society of the middle class to the agility and resilience of mid-size firms, the middle was seen as consistent with both individual and collective wellbeing. Yet, in recent years, the middle has become less stable, less predictable, and more elusive, and its primacy – in economics, politics, business, asset management, and even sports – has become increasingly unsustainable. Driven by structural changes, as well as lagging business and policy responses, the middle has been eroded – or is at risk – almost everywhere you look. Should this trend continue – which is subject to some debate – the implications would be far-reaching. For decades, a rising median household income in advanced economies anchored the growth of a middle class that often opted for the political center. Together with stable and trusted institutions, the middle class acted as a stabilizer for a more prosperous society. In business, too, an environment in which mid-size firms flourished was viewed as desirable, because it reconciled small firms’ lack of balance-sheet strength with their larger counterparts’ tendency to slip into oligopolistic complacency. But median incomes have stagnated, which, combined with the impact of technology and insufficient policy attention to the potential distributional effects of unfettered globalization, has gradually hollowed out the middle class around the world. As a result, both the hope and reality of a satisfying middle-class life, with its potential for upward social mobility, are in decline. In addition to weakening an important social stabilizing force, the diminution of the middle class has fueled the politics of anger and undermined the political center, hitherto dominated by established parties. As polarization and fragmentation have increased, bipartisan policies have become a lot more difficult to pursue. This trend is also reflected in declining public trust in expert opinion and established institutions. And all this has supported the growth of more extreme political parties and/or anti-establishment movements. The middle is also proving less friendly and stable for business. In sector after sector, mid-size companies face greater competition from small disruptors and/or their large counterparts. This includes the financial sector, where higher regulatory and compliance costs have eaten away at the sustainability of mid-size providers. This is visible in the number of mergers among mid-size asset managers that lack a strong corporate parent. Sports, too, is losing its middle. In the absence of forced equalization mechanisms (such as those used in the United States’ National Football League), European soccer is now dominated by a handful of teams that have become business behemoths. This last example also sheds light on important questions concerning what lies ahead. Is the erosion of the middle really inevitable? Are we in the midst of what economists call “multiple equilibria,” in which one unfavorable shift makes another, even worse, shift more probable? Or will a mix of natural mean reversion and responsive policies restore the soundness and benefits of the center? Given the rapid changes in technology and political disruptions, it is hard to know what lies ahead. But there seem to be enough indicators to suggest that, in certain areas, a strong middle can indeed be reclaimed if policies adapt quickly enough. That is probably the case when it comes to economic policies, where there is at last greater recognition of the importance of structural changes and distributional effects. For example, economists are beginning to resist the inclination to rely on too many simplifying assumptions that facilitate modeling but are removed from reality. They are also beginning to redress the inadequate inclusion of financial linkages and insights from behavioral science, as well as overemphasis on single equilibrium conditions. And they are deepening their understanding of accelerating structural changes associated with technology, the impact of China and other emerging economies, and the politics of anger. The more these changes feed into better policies, the greater the potential for political parties to present more compelling agendas, especially if they are presented by more engaging leaders. The decline of the middle in business is also likely to result in some pushback, though the impact will differ significantly by industry and will be continuously challenged by structural headwinds. It is more likely to occur in some industries, such as big tech, where a regulatory response will probably be one outcome of a developing backlash, and less likely for asset management. These developments have the potential to slow what, for now, has been a self-reinforcing migration away from the middle. But restoring faith in the feasibility and desirability of the middle – belief that the middle is strong enough to promote stability and prosperity – will take time, and sustained effort. And that loss of faith, compounded by accelerating technological change and the fragmentation of international order, goes a long way toward explaining why the future seems less predictable, and why the average person feels more unsettled. The U.K. alleges, and evidently more than 25 countries agree, that Russia ordered and executed a nerve agent attack on British soil this month in an attempt on the life of a former Russian spy. If true, this brazen act warrants a stern response. That response came earlier this week, when more than two dozen countries, mostly in Europe but including the U.S., Canada and Australia, said they would expel varying numbers of diplomats from Russian embassies and consulates in their territories. Russia has denied the charges and vowed to hit back. The assumption, then, is that the expulsion of diplomats is a serious matter, approximately on the level of trying to assassinate someone on foreign soil. But is that really the case? It is difficult to know the precise impact of the expulsions, but any analysis of this should begin with the fact that the people who were expelled were known by their host governments to be Russian intelligence personnel, and were expelled for that reason. And if they were known to be intelligence personnel, then their chances of being effective spies were limited. A spy who is known to be a spy will likely be under surveillance, greatly impeding his or her ability to spy. Host countries suspect every diplomat of being an intelligence officer, because many of them are. An assistant to the cultural attache who has never heard of Mozart is either the nephew of the president or is using his post as a cover for his intelligence operations. The problem with inserting intelligence officers this way into any country, let alone a hostile or adversarial country, is that the officer, regardless of his taste in music, is likely to be put under surveillance by counterintelligence. Monitoring all or most embassy staff is an expensive proposition, but the more adversarial the relationship, the more resources are devoted to the task. In the case of British-Russian relations, we can assume that almost all their embassy personnel were under surveillance, their phones were tapped, and they were regularly approached by attractive but lonely people. For this reason, countries are careful about how they conduct their sensitive intelligence work. More to the point, the most sensitive operations are kept far away from the embassy staff. The British knew that anyone contacted by a Russian officer might be a Russian asset. If the Russians had an asset in the British Ministry of Defense, for example, the last thing Russian intelligence would want would be for this asset to have anything that could pass for contact with a Russian embassy official. The source’s existence would be kept from the embassy personnel, save possibly from the Russian handler controlling the asset. A valuable intelligence asset – or an assassination – would not be run out of the embassy but by a team invisible to the embassy, because the assumption is that everyone in the embassy is being watched. There are four functions that intelligence officers assigned to embassies may have. The first is to coordinate with the host country’s intelligence services. The second is to immerse themselves in the gossip of the nation, from which interesting morsels might be gathered. The third is to collect the vast amounts of open-source material that permeates societies. This can be very valuable and unclassified, but it can be hard to find. The fourth is operating technical intelligence, intercepting communications through technology. Not included are genuine covert operations. Let’s consider each function separately. The liaison function would likely be carried out through the embassy. The Russians and Americans cooperate on some aspects of counterterrorism, and I assume the British and Russians do too. Much of the coordination probably takes place at the embassy, most likely involving some of those under what is called in the U.S. “official cover.” Why this is done through embassies rather than out in the open frequently has more to do with interagency rivalry than the need for cover. I would guess that the CIA, FBI and State Department compete for the task of liaison and spend a great deal of time competing with one other. The same is true for Russian foreign intelligence (the SVR) and military intelligence (the GRU). In addition, intelligence agencies sometimes talk to each other on subjects that their governments don’t want to leak. So, a conversation goes on between intelligence officers pretending to be cultural attaches even though both participants know perfectly well what the other is. Gossip is not a trivial source of information. It doesn’t have to be a drunk revealing the date of an invasion. The simple process of human interaction can reveal useful things to someone who listens carefully and connects the dots. Embassy parties, one of the great burdens of civilization, can not only yield insight but also create genuine friendships that over the course of a career can be nurtured and exploited. The universe of gossip is both older and subtler than the internet, and for this, embassy personnel – even those known to be intelligence officers – are extremely useful. Of course, gossip is also a vector of carefully packaged lies designed to confuse. Collecting elusive open-source material is also valuable. I recall a story of a Soviet medieval scholar who spent his days at the California Institute of Technology with a pile of quarters and a copying machine, an ancient but effective technique. Embassy personnel can be found at technical trade shows, university symposiums and the like, collecting perfectly legal documents that can tell a trained analyst much about the technical strategy of another nation. Most important, attendance can lead to friendships with scientists and others that appear merely personal but are part of a systematic attempt at exploitation. Perhaps the most important use of an embassy is the collection of technical intelligence. Not too long ago, embassy roofs were covered with antennae, while the building across the street hurled microwave radiation to blind the antennae. Today, the emphasis is on physically penetrating the underground networks carrying the internet. The embassy is an excellent means for managing the intercepts and analyzing the traffic. The expulsion of diplomats is a means of showing displeasure without interfering with a country’s actual intelligence gathering. The most sensitive intelligence work isn’t done at the embassy, and more important, the countries involved in this round of expulsions do not actually want to dramatically reduce the Russian intelligence capability. Blinding Russian intelligence only increases risk. In a tense relationship, it is important to make certain that the other side is reasonably aware of the other’s intentions and, in a broad sense, capabilities. The disequilibrium of intelligence can breed mistakes that are bad for all involved. It is individuals who will suffer the real punishment. Russians who made their careers by being experts on the U.K., for example, no longer have careers once they are expelled and forever prohibited from returning. The same can be said of an American who is an expert on Russia but is now barred from Russia. This is a strange casualty of international tension, but not one of high concern. The point is that, while these expulsions make good and perhaps necessary public statements, crippling each other’s intelligence outside the context of all-out war can have unwanted results. The quiet conversations between intelligence officers who appear to be cultural attaches but are known to both sides as embassy spooks serves a needed function. It’s the liaisons who can explain, for instance, that Russian military exercises outside of Belarus are just for show. But embassies make poor homes for truly covert operations. Those operations will continue. Fear of Missing Out (FOMO) is a huge part of the Millennial psyche. But while that extends to everything that goes down on social media, this generation doesn’t seem to be worried about missing out on retirement funds. Millennials—or Generation Y—are today’s late teens and twenty-somethings born in the 80s and 90s, and they number some 80 million people in the United States. And because FOMO is the Millennial common denominator, the financial detours are numerous. Thanks to the meteoric rise of social media advertising, Millennials have endless options for spending money, and they account for an estimated $1.3 trillion in annual consumer spending. Half of Millennials have made unplanned purchases because of something they’ve seen on social media. And half claim they spend more money on nights out than they do on rent or mortgage payments. Some studies even suggest that nearly 70 percent of millennials experience FOMO when they can't attend something that their family or friends are attending. FOMO rules their days and nights, but so does an apparent gut feeling that the world won’t exist in its present form by the time they retire. According to the National Institute on Retirement Security, some 66 percent of Americans between the ages of 21 and 32 have nothing saved for retirement. It also suggests that 95 percent of Millennials aren’t saving enough for retirement, and just over one-third participate in employer-sponsored retirement plans. Exacerbating the situation, Millennials also face a higher life expectancy, lower income replacement from Social Security, and are less likely to have a traditional defined benefit pension. 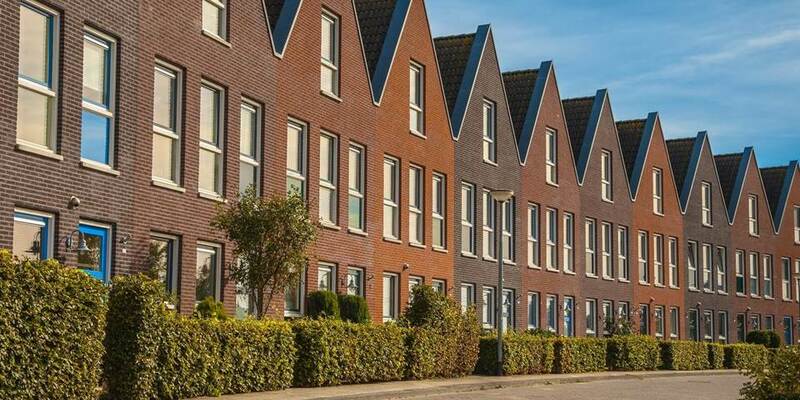 “This means Millennials must save significantly more than previous generations to maintain their standard of living in retirement,” the report says. The March 2018 report is based on 2014 census data, so we’ll give it a wide berth, but if even 50 percent of the people that fall into this age group have zero saved up for retirement, the country might look like a very different place in 40 years. But that’s exactly what Millennials are counting on. It’s not a crazy notion for a generation that lives in poverty more than any other. 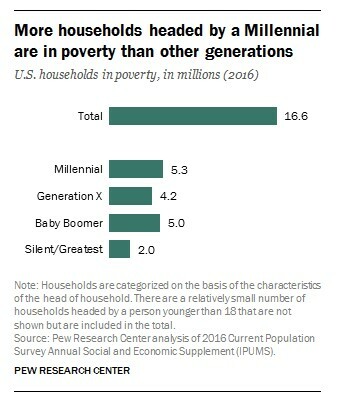 A Pew Research poll from last September noted that “5.3 million of the nearly 17 million U.S. households living in poverty were headed by a Millennial”. Millennial finances took a hit in the 2008/2009 financial crisis, and the high costs of education have also taken a toll. According to a recent Bank of America survey, 16 percent now have savings of $100,000 or more, double the amount of young people who had saved that much in 2015. 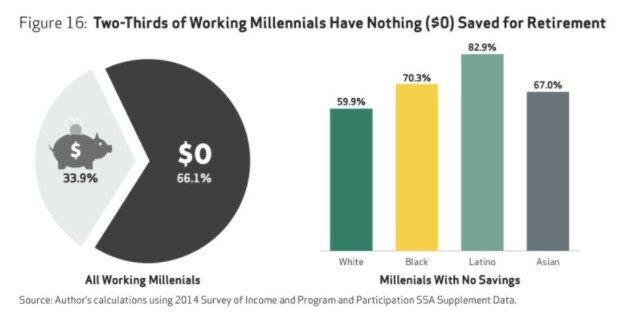 But the bank warns us against thinking that Millennials are just bad with money: "Despite stereotypes of Millennials as being foolish with money and not long-term planners, they are actually behaving quite responsibly when it comes to money,” the report said. Millennials aren’t as convinced that the status quo will remain unchanged in the, and they appear less inclined to make long-term decisions. And it’s not just because of the instant gratification habit honed by social media. Millennials see a world soon to be dominated by artificial intelligence—for better or worse— and a higher potential for instability and social change. It’s not simply frivolous short-term thinking. They may see retirement funds as at risk either way. If the world gets darker, Millennials might end up being more self-sufficient.